In our on-going saga of bring our new house up to snuff and out of the 90s and into the modern, I tackled the Family Room. 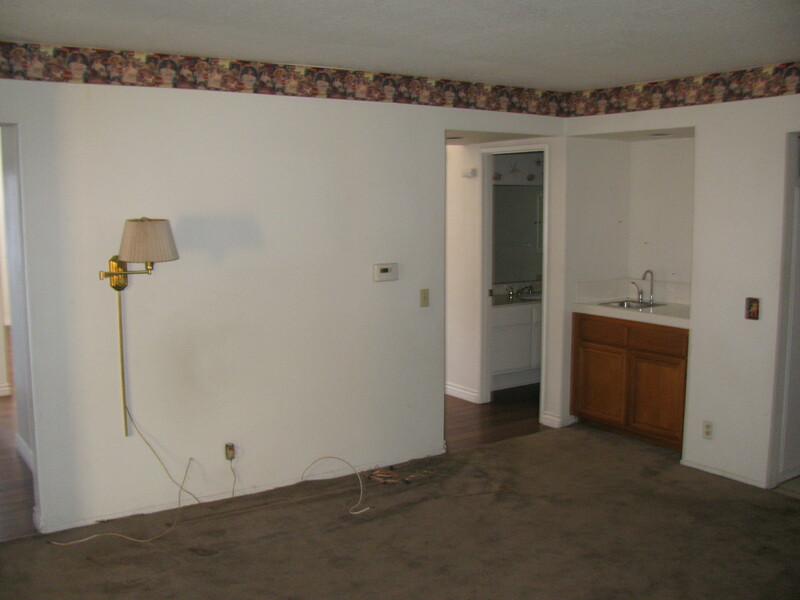 As with the rest of our house, our family room was trapped in a bad flashback into the 90s featuring a vintage Coke wallpaper border on white walls, brown carpet stained with numerous pet and oil stains, superfluous electrical strips going everywhere…even through the carpet itself. We had been left an awful brass wall fixture fitted with a brass cord cover planted firmly on our main wall…can we say eyesore. My first step to this overhaul was finding inspiration…actually locating my inspiration page. I have been pulling ideas for years. I also knew it needed to blend with the adjacent kitchen. 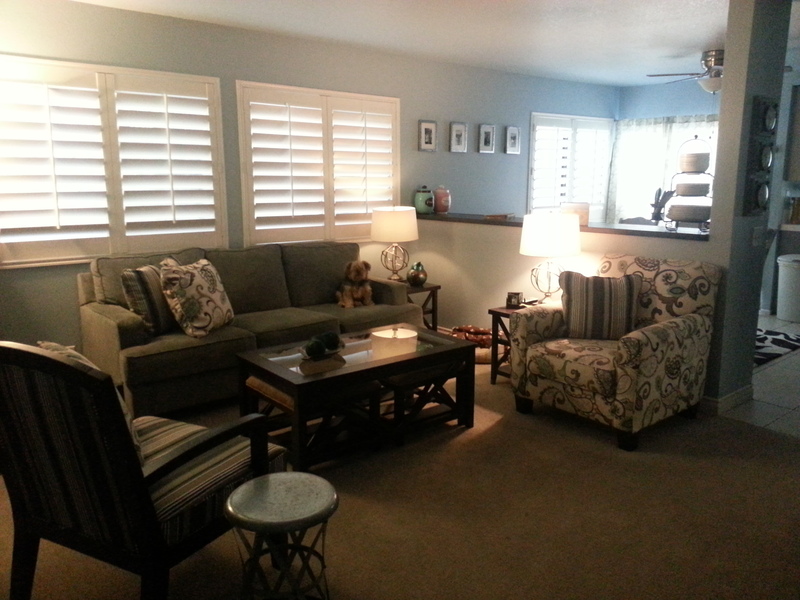 I fell head over heels in love with the Family Room Sarah Richardson and Tommy did on their Season 4 Sarah’s House. It was this warm, rich room that enveloped you in comfort and invited you to sit down, have a coffee and stay awhile. Yet it still managed to stay light and sophisticated with its coffee inspired hues and nod to the adult side of design. Just because kids are going to be there doesn’t mean that the room has to resemble their playroom. Thank you again Sarah Richardson and Tommy for fabulous designs that make great inspiration! I knew I was not going to mimic their palette completely – first and foremost I had gray cabinets so gray walls were out. I have a personal issue with beige. I think it is an absolutely beautiful color but, save for my personal bedroom, 25 plus years was spent surround by palettes solely of white, beige and brown. So with my own home, I was adamant that beige could be used but would not be the primary color or sole wall color. I also knew I want to room that felt warm, cozy, inviting and relaxing…calming. You know, the place where you grab your coffee, blanket and sink into the couch to watch the fire. Yet I wanted to it to definitely have a grown up modern adult feel to the room. 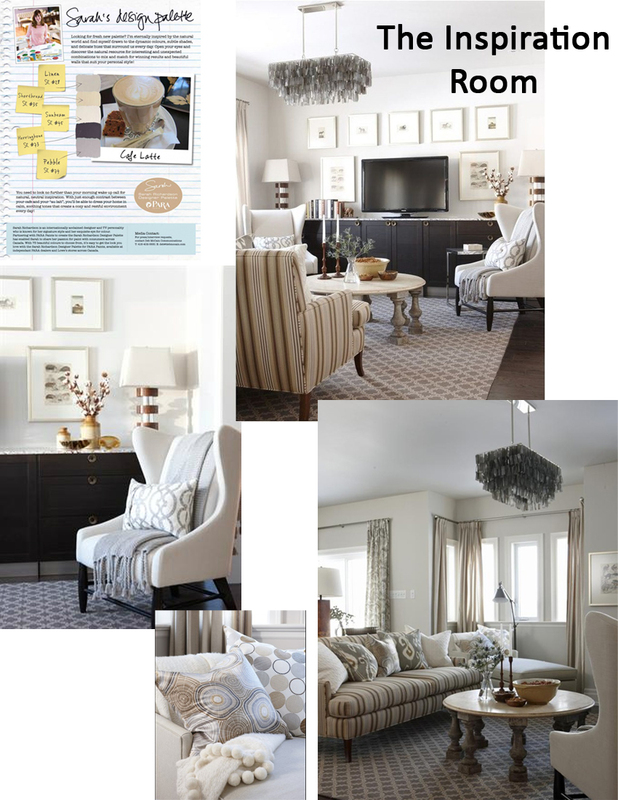 I was looking for prints that utilized the color palette from Sarah’s design, design elements that bridged the gap between cozy and comfortable with modern, sophisticated and adult. I definitely wanted chrome and brushed nickel finished elements versus brass or gold. And I want to mix surprise elements like industrial with more formal elements. Some of the Elements that I hoped would help capture the feel I wanted. In my case Sarah’s House. Once you have it, use it as a jumping off point. I try to envision how I can translate my inspiration into the room and begin brainstorming from there. I also write down a list of what I have for the room already and then I make a list of what I still need to source (price). I personally like to go price and do a general search for items I need for the design. I do this because I have found that pillows are easy, reupholstering a couch, not so much without the cash. 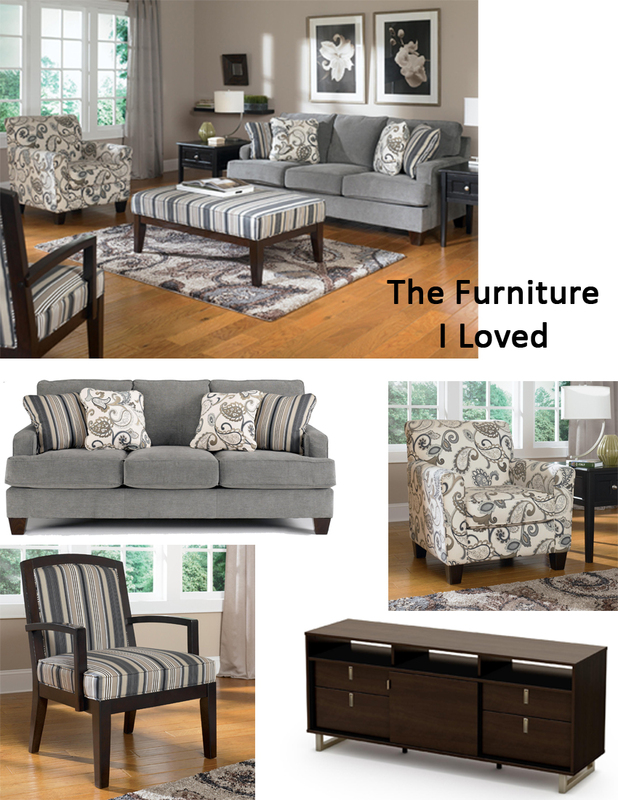 As I try to find big ticket items that I don’t have to reupholster, finding them first is vital in my opinion. So that’s what I did here – found the exact couch and chairs that I wanted. I even found the coffee table with ottoman chairs underneath for extra seating. 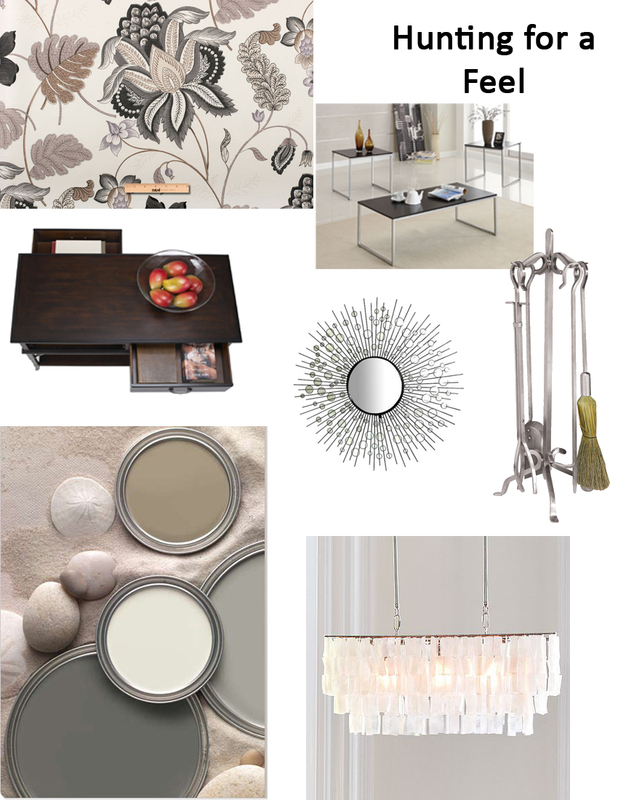 Choose Your Palette and Match to Existing or Big Ticket Items. In this case what I mean is pick the colors – wall, ceiling, accents – from the pieces you already have. In my case, I picked a blue (to help the room feel calming) for the wall color and ceiling straight out of the chair. I also picked the blue because it had a gray based that would complement the kitchen cabinets without looking too washed in gray and because it would make the molding and shutters pop. 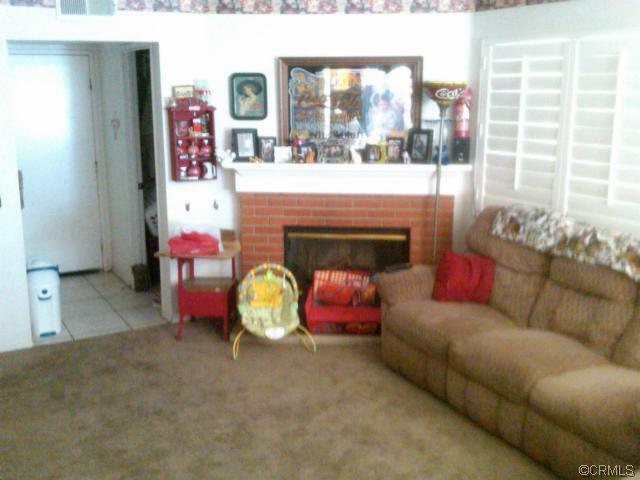 We picked a gray beige carpet, again from the fabric on one of the chairs, to contrast and complement the wall color. Accents and accessories came out of our furniture. Work from the Outside to the Inside. This really means that when you put the room together, start with your walls and ceiling and floor treatments, then move on to the furniture and lastly the accents. Lights in a room and where they are placed are huge! Our lighting plan is still partly in the works but if you are not careful, you can have too much light in some places and not enough in others. Over the next several posts, I will chat about what I learned when it came to selecting and installing flooring, painting and compromise, assemble your own furniture, the bar, fireplaces where red becomes a challenge, and lastly for fur decorating the mantle. Along the way, I will share more before and after photos but for now, here is a sneak peek. I know the little sort of went funny but here is a sneak peek at the After. My personal favorite accessory is the cute adorable little teddy bear like Yorkie sitting on the couch. He just had to be in the photo…he’s my little camera ham. Love the room. LOVE the ham! Looks great! I’m a huge Sarah Richardson fan….can’t go wrong with that type of inspiration!!! Thank you! Same here on Sarah – totally fan! I hope you enjoy the family room series and you should check out the Temporary Dream Kitchen. Her kitchen from the same season inspired me there. Will definitely check out….though it will likely just make me insanely jealous!! !